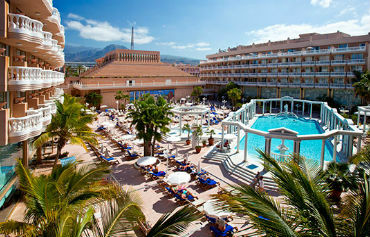 Cleopatra Palace Hotel is found next to Playa del Camison beach in the Tenerife resort of Playa de Las Americas. This stunning hotel comprises three Roman-style buildings around a large pool area surrounded by eye-catching columns and statues. 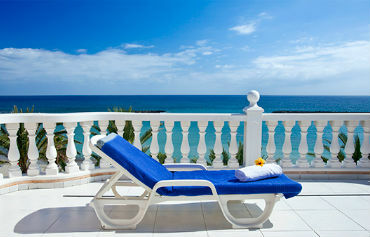 An ideal place to spend your daytimes relaxing in the sunshine. 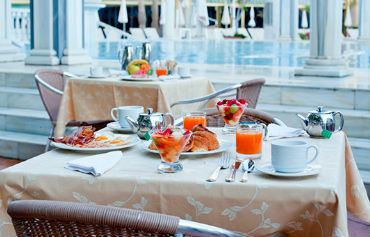 Eat like an emperor with delicious international buffets and sumptuous Spanish restaurant on-site. You don't have to wander far to grab a light bite or cold drink either, thanks to a tasty snack bar beside the glistening swimming pool. Entertaining the kids is easily done too with an action-packed children's club filled with games and activities. If you enjoy a paddle in the sea, the beach is on your doorstep. For some serious pampering the Mare Nostrum Spa is just next door, offering a full range of thalassotherapy treatments. Looking for some retail therapy? There's a large shopping centre just a short walk away along with lots of bars and restaurants to choose from. 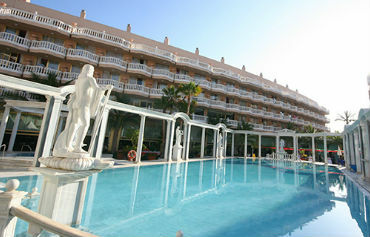 In the evening, take a saunter along the promenade, enjoy a quiet drink in the piano bar, or watch live entertainment. With sunshine, comfy guest rooms, and unforgettable style, you have the perfect recipe for a fun beach-holiday with family and friends. Cleopatra Palace Hotel boasts a good choice of facilities, including: Roman-style swimming pool, whirlpools, sun terraces, sunbeds, children's pool, playground, and playroom. There's a buffet restaurant, Mediterranean restaurant, sports bar, snack bar, convenience shop, small nightclub, and 24-hour room service. 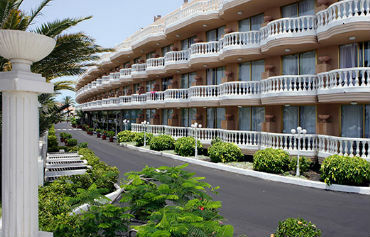 You also have a children's club, tennis courts, multi-sports court, pool table, and minigolf site. Cleopatra Palace Hotel has a Roman-style spa with gym, Pilates, yoga, tai chi, aerobics, body treatments, heated pool, and a beauty salon. There's a 24-hour reception, ticket sales, laundry service, airport transfer service, hair salon, and bike rental service. Cleopatra Palace Hotel offers a selection of rooms with views of the sea or pool.. All feature: air-conditioning, hairdryer, minibar, satellite TV, minibar, telephone, room service, extra bed (on request), 24-hour room service, balcony or terrace, and free Wi-Fi. Cleopatra Palace Hotel offers international buffets for breakfast, lunch and dinner, including speciality dishes and show cooking. 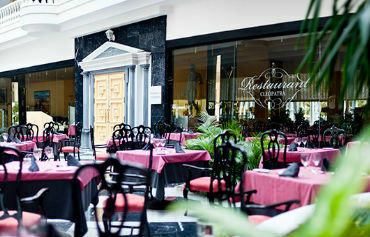 Restaurante Windsor serves Mediterranean and local cuisines, while Bar Vitaminas offers fresh juices, salads and ice creams. Head to La Palapa Beach Club for sunsets, music and cocktails, or Sports Bar to watch some matches with a drink. Salon Imperial provides evening entertainment, a fully-stocked bar and small nightclub. There's a variety of shows and activities available at Cleopatra Palace Hotel, including: sports events, competitions, dances, illusionists, and live performances. 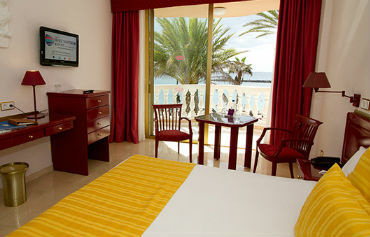 Cleopatra Palace Hotel is next to the beach in Playa de Las Americas. 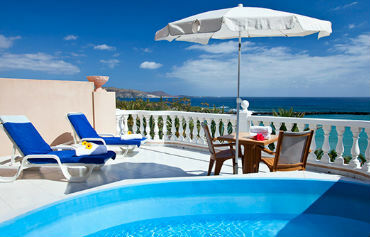 It's located 18km from Tenerife South Airport. think this hotel is getting a little tired. Great hotel with friendly staff. Food was only mediocre for such a quality establishment. We've stayed here before and hotel/food/location alone would be an excellent. However, one particular member of staff was so rude and unhelpful on numerous occassions when we needed to find out about our taxi transfer home. Also extremely hard to see a thomson rep here! Eventually the accommodation was good. However we changed rooms 3 times due to a leak in the air conditioning, causing a small flood, which was apparently fixed each time. After the 3rd time we moved rooms but this wasn't until half way through the first week. We were so thrilled with our hotel, it was everything that we wanted. It was quite amazing, the food excellent, swiming pools fantastic and the beach was so nice and very convenient to the hotel. Our standard room was more than adequate and I would have no hesitation in recommending the resort and the hotel.